It's GIVEAWAY TIME here at Kobelco Construction Machinery Australia! It’s so quick and easy to enter - read on below! 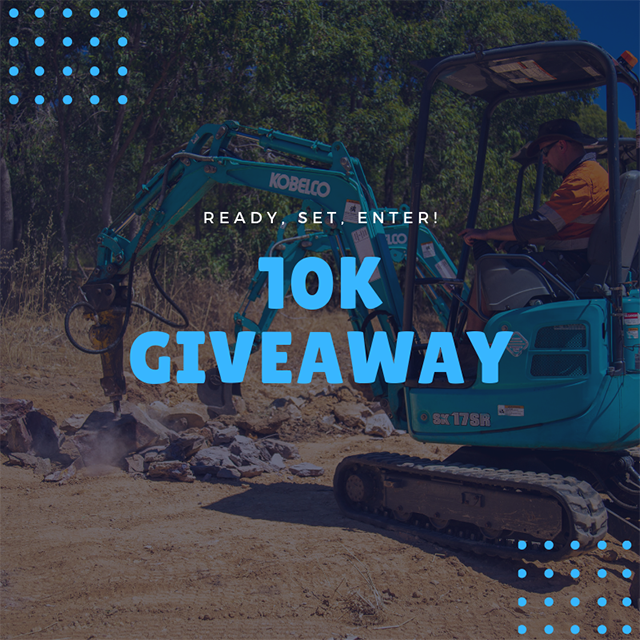 Kobelco has reached over 10,000 followers, and to celebrate we’ve teamed up with Earthmoving Equipment Magazine to give away 3 Bunnings vouchers worth $200 each plus a Kobelco SK135SR-5 scale model to 3 lucky winners! PLUS the first 50 that enter will receive 1 year free subscription to Earthmoving Equipment Magazine. You can also easily gain extra entries for more chances to win! Simply read the full post Kobelco 10K Giveaway post on our Facebook page. This giveaway opens on the 8th April 2019 10am AEDT and ends on the 30th April 2019 at 8pm AEDT. Only open to Australian residents. This giveaway is no way endorsed, affiliated or sponsored by Facebook. A random prize draw will occur 6th May 2019. Winners will be contacted via Facebook and announced here on 7th May 2019.